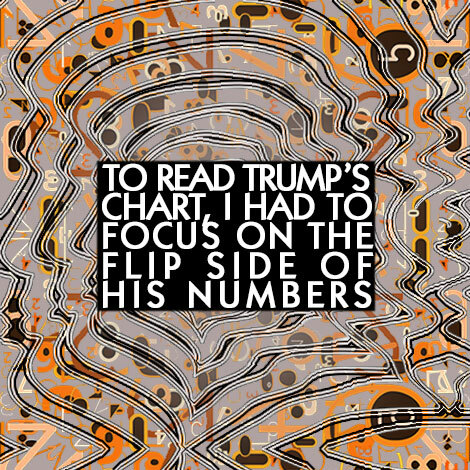 People have been asking me to discuss Trump’s numerology chart for months, long before the election. I hesitated to write this piece due to my personal feelings about our new President, but also because his chart is complicated and misleading. Funny, years ago I wrote an article on Trump for a New Age Magazine (in the mid 80’s if I remember correctly). I vividly remember being surprised by the extent to which his chart did not match his actions… until I looked at his numbers and considered their negative influences. That’s when the chart began to make sense. Let me back up a little. In numerology, every number has a front and a back, a positive and a negative side. A numerologist will usually focus on the positive aspects of the numbers involved; however, it’s also important to keep an eye on the negative influences, especially when the chart is clearly off balance. As a rule of thumb, numbers affect us positively when they are neutral, supported, or balanced by other numbers in the chart. They affect us negatively when that is not the case. A numerology chart is not unlike a musical composition - it can be beautifully harmonious, horrifically out of tune and nerve grinding, or somewhere in between. However, the player also has a wide range of options and almost total freedom to improve or destroy the piece. For example, if you encounter someone whose chart is dominated by odd numbers, you can be pretty sure the negative sides of these numbers will play a significant role in their make-up. In addition, if the only even number is particularly discordant with the dominant odd numbers, you are probably looking at a troubled individual. And yet, if this person has an innate drive to be the best they can be (which should also be visible in the chart), their quality of life may improve dramatically as time goes by. Conversely, if they are not motivated to improve, things are likely to become worse with age. 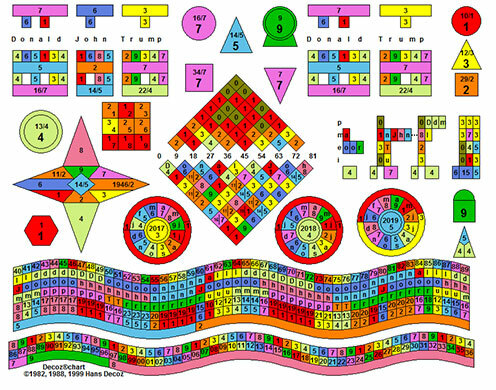 Which brings me to a numerology chart that is both unbalanced and extreme: Donald John Trump. Trump’s core numbers consist of two 5’s, two 7’s, and a 4. In addition, he has several hidden 7’s in his full name at birth. Let’s start with the 7. The positive attributes of the 7 bring a seeker of truth and high moral values, a perfectionist, spiritually inclined, introspective, analytical, and thoroughly intellectual. Its negative side is the exact opposite: inarticulate, cynical, sloppy, superficial, lacking the willingness or ability for self-examination, and intellectually lazy. The two 5’s among Trump’s core numbers are particularly troubling. The 5 is a difficult to control, chaotic, undisciplined number. On the positive side (in a normal, balanced chart) it is flexible, adaptable, quick-witted, freedom-loving, and tolerant. But in an off-balanced chart such as Trump’s, it is likely to serve up little of the positive, and plenty of the negative aspects: inflexible, slow-witted, arrogant, over-bearing, selfish, thin-skinned, and intolerant. However, the culprit largely responsible for Trump's “DNA “ (skewed heavily toward negative tendencies) is his 4 Life Path. A 4 Life Path viewed by itself is just fine - in fact, it usually points to a solid, grounded, morally stable, loyal, honest, and reliable person. The problem enters when we group this honorable even number with four negatively expressed odd numbers. It is not unlike placing a decent person in a cell with four nasty punks, for life; the only way he might survive is by turning away from his normally decent, noble side in favor of his negative side – effectively becoming a punk as well. The negative nature of the 4 is dishonest, corrupt, cruel, greedy, pompous, bullying, and cold. Let’s look at the cycles affecting Trump over the next 2 years. From the middle of 2014 until the middle of 2019, Trump has a 19/1 Essence. He won the presidency during a 2 Personal Year and was sworn into office during a 3 year. His Transits are D, H, and P, which will not change until 2019. For the next 2 years, Trump will carry a 19/1 Essence. The 19 is a Karmic Debt number that speaks to a lack of support - a loner’s number. There is little doubt that despite the fact that he is surrounded by others almost 24/7, he is likely a very lonely man. This Karmic Debt number suggests the people who support him do so for their own benefit; love, loyalty, and friendship are, predictably, lacking. However, the 1 is also the strongest, most ambitious, and most driven of all numbers, which tells us the man will not back down – confronting anyone and anything that gets in his way. The combination of a stand-alone, unprincipled, ego-driven loner, surrounded by self-aggrandizing bureaucrats, is a recipe for disaster. Because inevitably, he will break – in a spectacular manner, I am sure. Trump is currently in a 3 Personal Year, which is probably one reason he appears to be getting away with murder – figuratively speaking. The 3 is highly verbal. It gives us skilled writers and inspirational speakers, but also divisive, caustic agitators. Trump is called out daily for his excessive lying (alternative facts), and the inability to express himself intelligibly - all negative aspects of the 3. His Transits provide further details. Trumps (D) Transit tells us he is physically strong; his (H) suggests he is mentally focused on financial gain more than anything else, and his (P) transit suggests a lack of spirituality or devotion to anything other than himself, giving him an inflated sense of self-worth. In 2019, Trump’s Physical Transit changes to a (O), which doesn’t bode well for his health, stamina, or emotional stability. His numbers suggest he may not remain President by 2019, but I am aware my opinion may make this wish the father of the thought.